Category A represents the anxious attachment style. 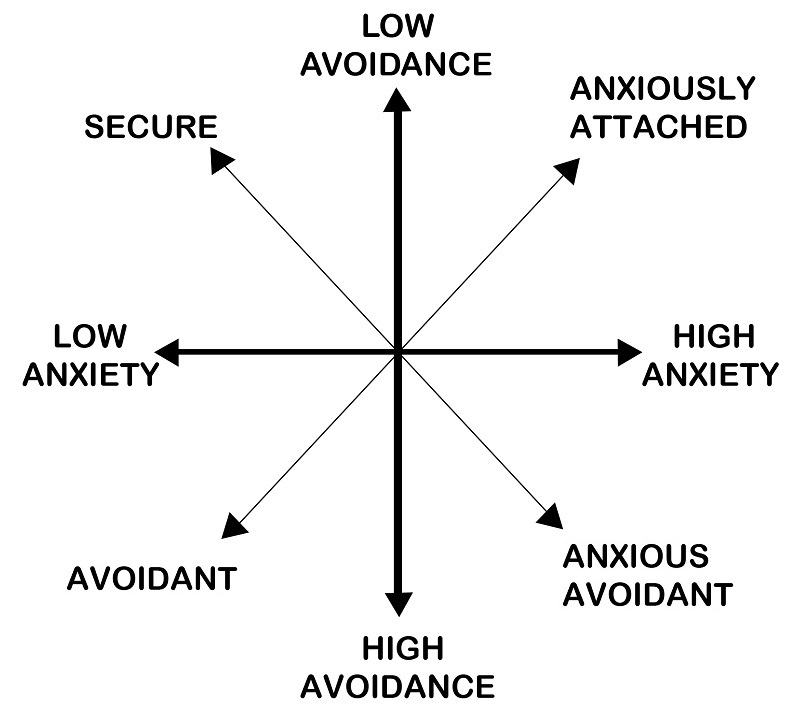 Category B represents the secure attachment style. Category C represents the avoidant attachment style. relationship and get easily upset. As a result, you tend to act out and say things you later regret. If the other person provides a lot of security and reassurance, however, you are able to shed much of your preoccupation and feel contented. Being warm and loving in a relationship comes naturally to you. You enjoy being intimate without becoming overly worried about your relationships. You take things in stride when it comes to romance and don’t get easily upset over relationship matters. You effectively communicate your needs and feelings to your partner and are strong at reading your partner’s emotional cues and responding to them. You share your successes and problems with your mate, and are able to be there for him or her in times of need. It is very important for you to maintain your independence and self-sufficiency and you often prefer autonomy to intimate relationships. Even though you do want to be close to others, you feel uncomfortable with too much closeness and tend to keep your partner at arm’s length. You don’t spend much time worrying about your romantic relationships or about being rejected. You tend not to open up to your partners and they often complain that you are emotionally distant. In relationships, you are often on high alert for any signs of control or impingement on your territory by your partner. • Your comfort with intimacy and closeness (or the degree to which you try to avoid intimacy). • Your anxiety about your partner’s love and attentiveness and your preoccupation with the relationship. • If you feel comfortable with intimacy with your romantic partner (i.e., are low on intimacy avoidance) and don’t obsess much about the relationship or about your partner’s ability to love you back (i.e., are low on relationship anxiety) but coast along with it—you’re probably secure. • If you crave intimacy and closeness (i.e., are low on intimacy avoidance) but have a lot of insecurities about where the relationship is going, and little things your partner does tend to set you off (i.e., are high on relationship anxiety)—you’re probably anxious. • If you feel uncomfortable when things become too close and intimate and value your independence and freedom more than the relationship (i.e., are high on intimacy avoidance) and don’t tend to worry about your partner’s feelings or commitment toward you (i.e., are low on relationship anxiety)—you’re probably avoidant. • If you are both uncomfortable with intimacy and very concerned about your partner’s availability, you have a rare combination of attachment anxiety and avoidance. Only a small percentage of the population falls into this category and if you are one of them, you can benefit from information on both the anxious and avoidant attachment styles. See more in the book Attached: The New Science of Adult Attachment and How It Can Help You Find – and Keep – Love by Amir Levine Rachel Heller.